If somebody was accused of witchcraft, there were several procedures to determine whether they are a witch or not. Admitting, these trials were more designed to force the victim to confess rather than determine if they were innocent or guilty. Although different countries had different methods, some countries were better known for some than others. The U.K specialized in methods like ducking and pricking. Ducking was a procedure, when the witch was tied dropped in the river to see if she floated or not. If the witch floated, they were guilty and were hanged, if they drowned they were innocent and then died anyway. A little pattern seems to form. The idea behind this was that if they were a witch, the devil would protect them and not let them die. Another method was to prick the victim continuously until a point was found where no pain was felt, known as the pricking method. The reasoning behind this was that if the victim would have a point of protection where they would feel no pain, this was another form of protection from the devil. Once it was decided if the victim was guilty, more than likely they were, they were punished by death. 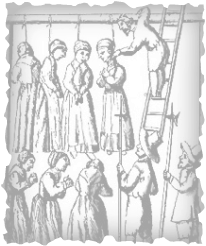 A popular punishment in the UK was death by hanging. This was a slightly less severe punishment than other European countries that preferred to set alight their witches. The hangings were public events and many local villagers were spectators.